Includes: BOSE Cinemate GS Series II subwoofer, x2 BOSE speakers, BOSE universal remote, cables, disc. Serial #: 051465901540252AS. 4.5 out of 5 stars - Bose CineMate Series II 2.1 Digital Home Theater Speaker System - Free Shipping! 91 product ratings91 product ratings - Bose CineMate Series II 2.1 Digital Home Theater Speaker System - Free Shipping! 2 Bose Speakers. 2.1-channel speaker system with premium Gemstone speakers, improved digital acoustic performance. Simplified setup, with only a few connections to make. Power Cord. Speakers and subwoofer is in good condition. light scratches. the audio input device works with analog audio, the digital input socket is broken but works. you need to ziptie the digital cord to the main cord because it will not lock in place. This sale is for a subwoofer, two speakers, speaker cables and Transmitter. bose cinemate series ii. Condition is Used. Working great and is in good cosmetic condition. All wire and cabling included along with Bose Universal remote. BOSE Cinemate Series II Digital Home Theater System. BOSE THEATER SURROUND SYS. BOSE Cinemate Series II Digital Home Theater System. BOSE THEATER SURROUND SYS.. Condition is Good everything in working condition. This set is 100% complete package minus the remote control. We have looked everywhere for it and if it should surface it will certainly be added to this sale. As it is this package does not include a remote control and product has been priced accordingly. Shipped with FedEx Parcel Select tracking available through EBay’s platform so your able to monitor it . Thank you for reading. Pair Bose Cinemate AV3-2-1 321 Series I II III GS GSX, Gemstone Speakers cables. Condition is Used. Shipped with USPS Priority Mail. Condition is Used. There are no rear or center speakers, eliminating much of the wiring of traditional 5-speaker systems. Bose CineMate Series II Digital Home Theater Speaker System Used. Condition is Used. Shipped with USPS Parcel Select Ground. 1 x Subwoofer w/Power Cord. 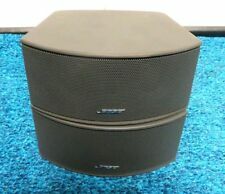 New ListingPair Bose 321 Cinemate Series I II III GS GSX Gemstone Speaker Very Good Cond. 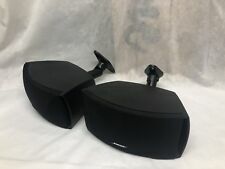 Pair Bose 321 Cinemate Series I II III GS GSX Gemstone Speaker Very Good Cond.. Condition is Used. Shipped with USPS Priority Mail. Bose 3-2-1 Gemstone Speakers Cinemate Series I II III Black w/ Interface Module. This pair of gemstone speakers with speaker cables are in very good physical and working condition. All electronics have been thoroughly tested, every component tested, stereo receivers, subwoofers, speakers, etc. have been tested for hours to ensure playability. Bose Cinemate 3-2-1 321 Series I II III GS GSX, Gemstone Speaker CABLE ONLY Black. Condition is Used. Shipped with USPS Priority Mail. The item is in Good working order. *Single speaker* No cables. Black in color, some scuffs and marks. Mounting brackets on back. Pair Bose Cinemate AV3-2-1 321 Series I II III GS GSX, Gemstone Speakers cables. Condition is Used. Bose gemstone speakers w cable AV321 or Cinemate Series I II & III graphite grey. Condition is Used. Shipped with USPS Priority Mail. The Bose CineMate Series II 2.1 channel speaker system enhances the digital acoustic quality of sound. Easy to connect, this 2.1-channel speaker system plugs directly to your TV indicating on the on and off status of your speaker unit. Subwoofer Only. We did our best to fully test this and found no issues. PO BOX number. Will show wear and tear. No cables. Silver in color, some scuffs and marks, grills fit tight. Mounting brackets on back. Pair Bose Cinemate AV3-2-1 321 Series I II III GS GSX, Gemstone Speakers cables. Condition is Used. No cables. Black in color, some scuffs and marks, grills fit tight. Mounting brackets on back. Pair Bose Cinemate AV3-2-1 321 Series I II III GS GSX, Gemstone Speakers cables. Condition is Used. Avoid using abbreviations and acronyms whenever possible. Speakers contain moderate scuffs/scratches and minor chip marks due to previous use. Has been tested and is fully functional. Includes almost all original accessories. Used item. Has scratches in the subwoofer (see pictures). The system includes only the subwoofer and one speaker. It just that you see in the pictures. The receiver unit used for test this belonged from another unit (already sold). The patented Bose design produces low frequencies for all channels with no audible distortion. Articulated Array speakers. 2 Articulated Array speakers. A small interface module houses the audio input from your TV and displays on/off status for your system.